The new Mercedes E Class Cabriolet was made official at the Geneva Motor Show and now this new convertible will make its US debut at the New York International Auto Show on the 12th of April. The new E Class Cabriolet is available with a choice of different engines and it is larger than the car it replaces. Just in time for top-down convertible driving weather, the E-Class Cabriolet will premiere in the U.S. at the New York International Auto Show on April 12th. The new E-Class Cabriolet four-seater combines pure, elegant design with long-distance comfort for four occupants and the latest E-Class technology. Available for the first time with 4MATIC all – wheel drive, the E-Class Cabriolet also boasts AIRCAP® wind deflector and AIRSCARF® neck-level heating technology to enhance comfort when driving with the top down. The new Cabriolet is the newest and final member of Mercedes-Benz’s new E-Class family, which has been entirely renewed within the last year. 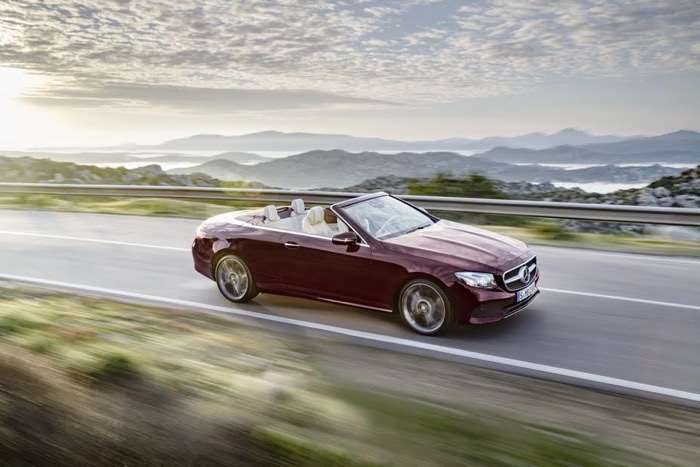 When the soft top is up, the E-Class Cabriolet has a silhouette similar to that of the E-Class Coupe and displays the same expressive proportions and clean lines. The “hot and cool” design idiom represents both elegance and intelligence, and shapes the appearance of the Cabriolet, which nevertheless exudes a unique character – especially when the soft top is down. You can find out more details about the new Mercedes E Class Cabriolet over at Mercedes at the link below.